La Rochelle is the region's transportation hub, from which you can train or bus to Rochefort and then bus or bike over the bridge to Île d'Oléron. The mainland end of the bridge to Île d'Oléron at Bourcefranc-le-Chapus is 27 km (17 miles) southwest of Rochefort and 65 km (40 miles) south of the Aéroport de La Rochelle/Île-de-Ré (map). Flights by easyJet, flybe, Hop!, and Ryanair arrive at Aéroport de La Rochelle/ Île-de-Ré (LRH) from Ajaccio, Brussels, Lyon, numerous airports in the UK and Ireland, Portugal and Switzerland. The Gare de La Rochelle serves regional TER trains. TGV trains cover the distance between Paris's Gare de Montparnasse and Niort in about 3.5 hours; to or from Bordeaux in 2.5 hours. 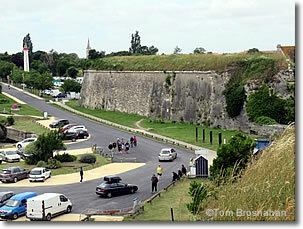 From Niort, TER trains connect to Rochefort, and Les Mouettes regional buses connect to Île-d'Oléron. bus, bike or on foot.